A friend of mine used to make fun of me because I check behind the clothes in my closet before I go to bed each night. After reading this post, she may not find my little quirk so amusing after all. Not long ago, a Tokyo man noticed that the food in his refrigerator was mysteriously disappearing. So he set up surveillance cameras around his apartment and sent the video feeds to his cell phone. 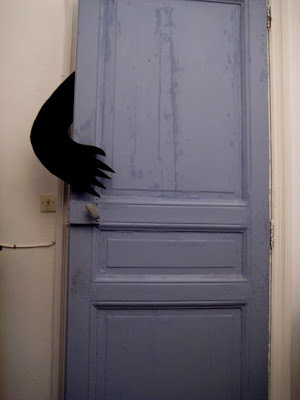 One day, the cameras captured a dark figure slinking through his house. He called the police, who found the doors and windows locked from the inside--and no sign of a burglar. Still, they decided to search the house. When they got to the closet, they made an unexpected discovery. Inside, they found a woman curled up on her side. But she wasn't a burglar. She had been LIVING in the man's closet for almost an entire year. How could this happen? Well, people in Japan sleep on futons. During the day, they often roll-up the futons and put them inside a closet. For this reason, Japanese closets tend to be particularly dark and deep. The woman claimed she'd snuck into the man's apartment one day when he accidentally left his door unlocked. During the day when he was at work, she would come out to shower and eat. Wow. This is probably only the... *tallies up on fingers* third or fourth time I've heard of somthing you've posted before you posted it. How... unusual. "I'll go ahead and clean out my locker I 'spooooooooose. Old papers... old pencils... old person..."
"I left a check for last month's rent on the table!" BTW, anyone know where I can read more about the story? xD This is one of the best I've heard in a long time...my mom nearly fainted when I told her about it! woah, I always check my closet before i go to bed too! its weird, i cant sleep unless its completely closed...and now i know why. Seriously, that would be kinda freaky to find out someone is living in ur closet. She was arrested right?????????? OMG not as creepy as when I was little. There used to be this 101 Dalmation costume in my closet when I was four and when the lights went out you could still see it. And it looked like a cow costume--scared me so much. Not kidding. I also used to think witches lived under my bed but that's a different story. uuuum, can you say creepy? That is soooooooooooooooooooooooo creepy & weird !!!!!!!!!!!!!!!!! I'm surprised i didn't find anyone in my locker when i cleaned it out! it was a disater !!!!!!!!!!!! Haha. I commented so late on this because I thought it was part of the post before. Odd. Rie: Wow, that sounds pretty cool. I've never heard of that school. Anonymous: I'm not sure what happened to her. I can't seem to find an update! Cupcake doll: I love that idea. In fact, if anyone wants to live in my closet . . . I saw this in the nespaper the other day! That's so weird! But wouldn't you notice a little difference if someone's been living in your home for a year? Thats pretty creepy...i don't think I'm ever gonna sleep soundly again unless I check my closet. There's definately space to hide! That's pretty creepy...There's definately space to hide in my closet.